I’d like to recommend Around the World . Three Remarkable Journeys by Matt Phelan. Not quite non fiction, but three biographical sketches. I’ll take it. The book is essentially three separate vingettes, each one focusing on world traveler in the 19th century who sought adventure through different modes of transportation. The come link is the inspiration of Jules Verne’s novel Around the World In Eighty Days where the main character tries to travel the world in 80 days on a bet and just because. 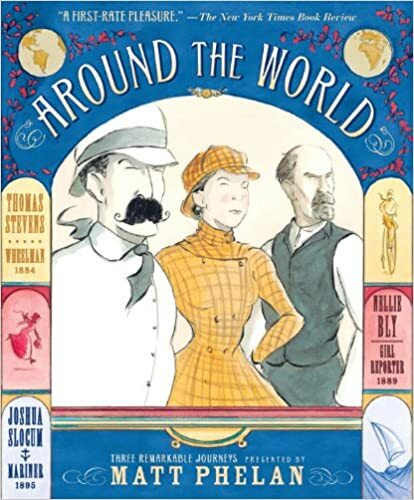 Thomas Stevens, Nellie Bly and Joshua Slocum were real people and it’s great to have a peek at their adventurous stories in this accessible way. The illustrations are muted and the words are kept to a minimum, lending the graphic novel to a sense of an early “talkies” film without sound but with some dialogue printed on the screen. There are many imagines with no words and a couple with just words. It really seems to work here. Perhaps this is intentional since Phelan wrote another excellent graphic novel called Bluffton about the childhood of Buster Keaton. Either way, it has both a 19th century feel and a sense of mystery as well where the reader doesn’t know everything. In this case, it’s a good feeling and leaves the reader wanting to read more about each adventurer. Good for grades 4 and up. Recommended for reluctant readers because the ideas here are plenty but the words are few. This looks great –we will definitely check it out! Thanks for the recommendation.